Why LINFINITY is the Answer to the Challenges of SMEs - I am a thinker, strategist, marketer, leader, innovator, visionary, opportunist, networker and the go-person for your business. In Singapore, Small-Medium Enterprises (SMEs) are vital contributors to the economy, with 219,000 SMEs contributing S$196.8 billion in gross value. Over the last five years, SMEs have helped generate half of the nation’s growth in gross value added, particularly from the burgeoning industries of food & beverage, manufacturing, retail and info communications. Similar figures can be seen in the Southeast Asian region, where SMEs play a crucial part to the region’s Gross Domestic Product (GDP), accounting for more than 95% of all business establishments. However, despite being the integral to the growth of GDP all around the world, the reality is that these businesses must still battle it out in an ecosystem which holds many challenges that are unique to these SMEs. SMEs today, therefore must look beyond traditional methods and embark on a journey of constant innovation, adapting new enterprise technology to meet their challenges as well as to sustain and accelerate growth. Typically, SMEs often concentrate on sustaining the business and increasing the scale of the company, so much so that they lose track of other vital components such as the system and process behind operations, logistics and supply chain. There is therefore a need to put in place a proper system or service that can ensure the growth of the company, whilst taking care of backend operations within the company. Smart contracts powered by blockchain may be one such solution with it being a beginner friendly concept that even the most technology-resistant individuals can embrace. Traditional contracts require the involvement of many parties, as well as the overseeing of a financial institution which smart contracts are free to do away with, acting as a distributed digital ledger. Smart contracts act as a ledger that ensures each transaction is irrefutable and enforceable, while streamlining the procedures behind the business. With LINFINITY, blockchain technology can be used to implement contracts and monitor any other transactional activity between various parties in the total supply chain network, allowing SMEs to save cost on unnecessary steps and measures in the governance of their supply chain belt. Passing through many hands within the total supply chain network, confidential and important information is always at risk. With blockchain enabling it to serve as a decentralized, distributed digital ledger, tracking and recording all aspects of exchanges, agreements, transactions and payments, information will be safeguarded in specific blocks, each linked to one another. Blockchain therefore serves as a protected platform where sensitive and private information would not have to be divulged despite multiple copies of this ledger being made available to different stakeholders benefiting SMEs who hold large amount of private information. In addition, this further ensures the security of any information that is present on hand, as it is kept away without any intermediaries involved. In the event of an encounter with legal disputes, the information stored on the chain could even serve a purpose, acting as legal evidence for regarded cases. People may forget and digital material can be hacked, but contracts and information stored on the blockchain can never be changed and altered. LINFINITY serves to be able to allow companies that have many different individual parties in their entire supply chain network, to have access to a single platform where the records are kept and safeguarded. Companies can have the option to manage their own blockchain with LINFINITY providing the blockchain technology or have LINFINITY aid in the management of their supply chain together with the full belt on LINFINITY’s chain to help smoothen the processes. Despite the importance of SMEs in contribution towards a nation’s GDP growth, SMEs often face issues accessing credit at the various points of the business when necessary. Due to being relatively young in nature with regards to incorporation, SMEs may not have a substantial track record on their credit history for banks to acknowledge, when requiring financial assistance. With supply chain financing, it can enable SMEs to have access to more financing at a lower cost. But even with supply chain financing, it comes with its own set of problems and blockchain may just be the answer to it. Problems that may arise include, the cost of borrowing for the SME to be unfavourable for them depending on the buyer’s bank, and a lack of transparency in transactions hence affecting tier 2, tier 3 suppliers. LINFINITY is embarking on implementing blockchain technology for supply chain finance that can greatly benefit SMEs. Such benefits LINFINITY can bring in the supply chain finance include a reduction of processing time while ensuring transparency and security and the inability for manipulation by parties. This further ensures increased control, speed, reliability and authenticity of each the total supply chain network. In addition, with the introduction of blockchain, it creates a token economy that enables the transaction of public goods and monetary assets to be more fluid. With stakeholders within the total supply chain network being active adoptive users, it will result in the value of the token economy to increase. This creates an established ecosystem where the tokens could be redeemed for various assets by members and users of the platform. Technology is moving fast, and we are currently living in what is popularly termed as the fourth industrial revolution. It is the age of the Internet of Things (IoT), Artificial Intelligence (AI), Big Data, Cloud Computing, and even digital banks. Companies and businesses that are serious about growth are currently scrambling to understand this new technology, trying to determine how it will evolve in the future. This however is where SMEs retain a significant edge. Being smaller, these companies have proportionately smaller systems and networks, making them nimble, being able to adapt and take on blockchain technology quickly with relative ease. It’s a different story for MNCs such as Alibaba for example, where integrating just a minor feature into the entire system would require good long period for the company to adapt. Moving forward, LINFINITY is not just looking at large, global scale clients, but is also paying special attention to SMEs, especially those in the FMCG sector, helping them to adopt blockchain technology into their own company’s supply chain. 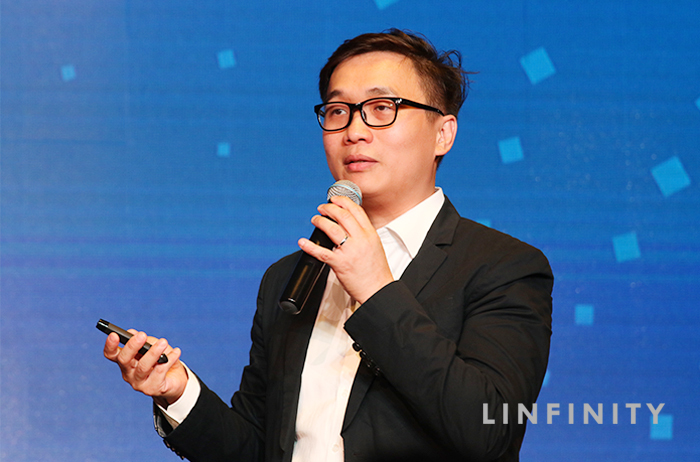 LINFINITY has been playing an active role in being involved in the application of blockchain in supply chain networks with various SMEs and their respective business models, advising and providing their expertise in the field. 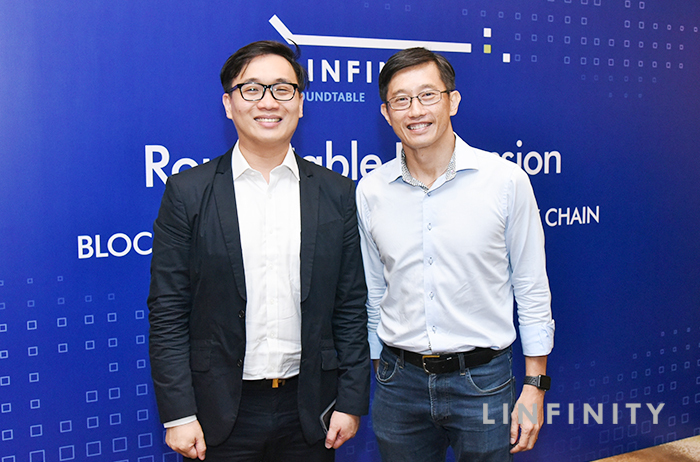 In August, LINFINITY hosted a roundtable discussion in Singapore that was held with industry leaders and entrepreneurs, covering various topics such as the potential of blockchain in enabling SMEs. Teo Ser Luck, member of Parliament, shared his sentiments on the revolutionized offerings blockchain can have for local SMEs in terms of not just meeting pain points and filling the gap, but its potential in disrupting traditional markets. The Singapore government has taken steps in recognition of the need for adoption of enterprise technologies solutions for local companies with specific grants catered towards SMEs such as the SMEs Go Digital grant and Technology Adoption Programme. With such grants that allow SMEs to build stronger digital capabilities through the adoption of various technologies, such as Blockchain, IoT and AI, each of these technologies come together to work together cohesively and complement one another and elevate SMEs to be part of the digital economy. Nobody really knows where the above-mentioned fourth digital revolution will bring our society. However, we need pioneers to push the technology forward regardless. LINFINITY is ready and has stepped up to be one of these pioneers in the Singaporean landscape, and have begun spreading their reach abroad, launching forums and talks across London, Tokyo, and Seoul. For more information about LINFINITY and their future activities, visit linfinity.io, or contact pr@linfinity.io.